Ms. Justine L. Hommel passed away on October 17, 2016, leaving a void within the Greene County community. 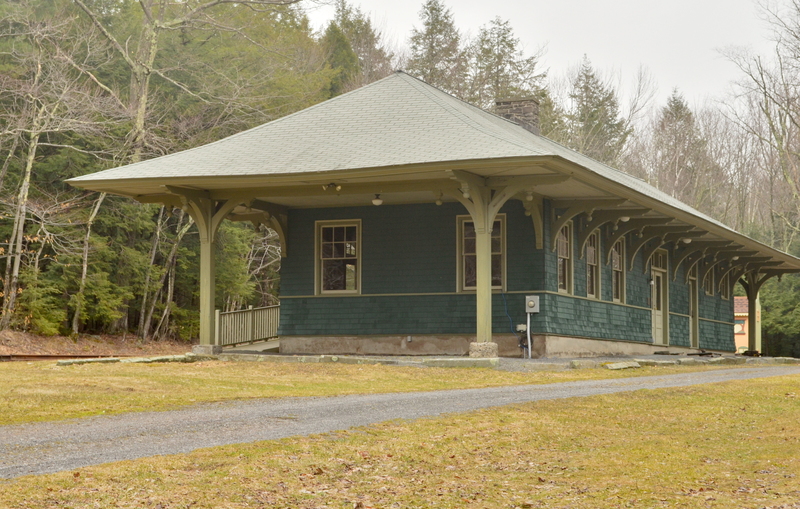 A lifelong resident of Haines Falls, a hamlet located in the Town of Hunter, Greene County, Ms. Hommel dedicated her life to preserving the Catskill Mountain's natural beauty and championed its historical significance to American culture. Ms. Hommel was responsible for ensuring the beauty of scenic roadways decades before anyone was noticing the significance of preserving this historic landscape. Her insistence on natural rather than man-made materials resulted in the stone retaining walls, rather than concrete, at the entrance to the Kaaterskill Clove on State Route 23A. 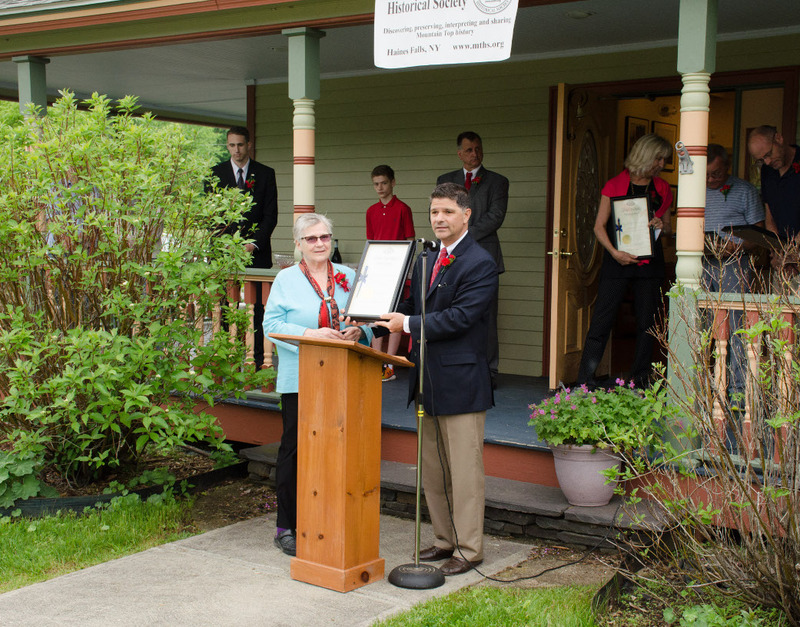 Ms. Hommel's committed efforts ultimately led to part of State Route 23A being included as part of the Mountain Cloves Scenic Byway and it is only fitting that we designate this portion of roadway in her honor. The "Justine L. Hommel Memorial Highway" will be a constant reminder of Ms. Hommel's remarkable contributions to the mountaintop region of Greene County and her life-long dedication to enhancing and preserving the natural splendor of the Catskill Mountains landscape. Here, State Senator George Almedore Jr. presents a copy of the official designation to Society President Cyndi LaPierre. The view from Pine Orchard made famous by the Catskill Mountain House has, in recent years, been increasingly obscured by brush growing at the brink and trees growing at the base of the cliff known as the Wall of Manitou. Throughout the 19th Century the view had been featured in paintings, engravings and photographs and praised in poetry and literature. Above - Pine Orchard Looking North December 24, 2017. ---- Below - Looking South from the same point. "Creation," said Natty, dropping the end of his rod into the water, and sweeping one hand around him in a circle, "all creation, lad. I was on that hill when Vaughan burned ‘Sopus in the last war; and I saw the vessels come out of the Highlands as plain as I can see that lime- scow rowing into the Susquehanna, though one was twenty times farther from me than the other. The river was in sight for seventy miles, looking like a curled shaving under my feet, though it was eight long miles to its banks. I saw the hills in the Hampshire grants, the highlands of the river, and all that God had done, or man could do, far as eye could reach-you know that the Indians named me for my sight, lad ; and from the flat on the top of that mountain, I have often found the place where Albany stands. And as for ‘Sopus, the day the royal troops burnt the town, the smoke seemed so nigh, that I thought I could hear the screeches of the women." 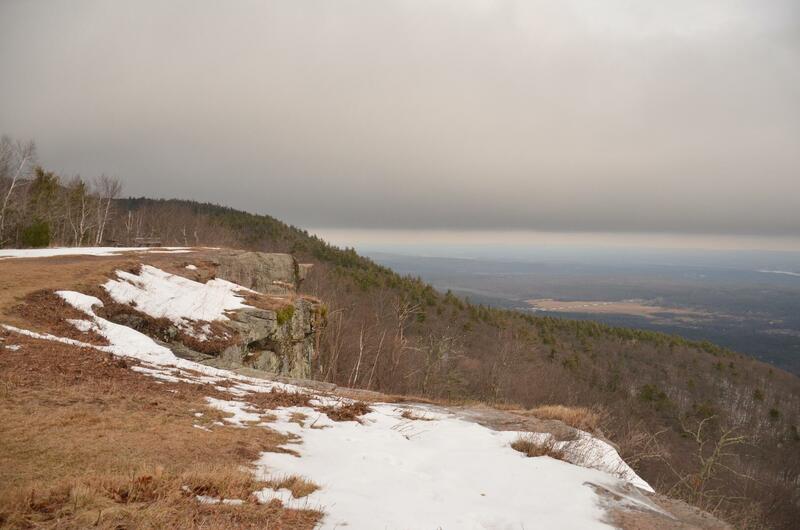 Thanks to the efforts of the New York State Department of Environmental Conservation and the work of the Operations Field Crew: Brett Byrne, Brendan O'Brien, Robert Aslaskon and Tyler Proper, that view of Creation has been cleared to an extent not seen in years. Once again the view up and down the Hudson Valley from Albany to the Shawangunks and into Vermont, Massachusetts and Connecticut is open and clear. It is now available as a beautiful place to stop during a walk for lunch, to pause for quiet contemplation, to bring students for an inspiring class visit or for an Easter morning Sunrise Service. New York State Licensed Guide Moe Lemire will be leading a series of outdoor events this winter. These fundraiser events will include a hike, a snowshoe walk and a cross-country ski excursion. The $10 requested donation for each event will benefit the Mountain Top Historical Society. Come explore North/South Lake Campground in the off-season. Experience the solace of the Lake without the crowds. This hike will begin at the parking area for the Mountain Top Historical Society in Haines Falls. We will walk the KRT trail to the new bridge crossing over the creek. We will then follow the yellow horse trail to the North/South Lake Road crossing over the dam and joining up with the yellow trail. We will follow the yellow trail around North/South Lake through the campground. We then will cross the road taking the horse trail back to the KRT and ending back at the Mountain Top Historical Society. 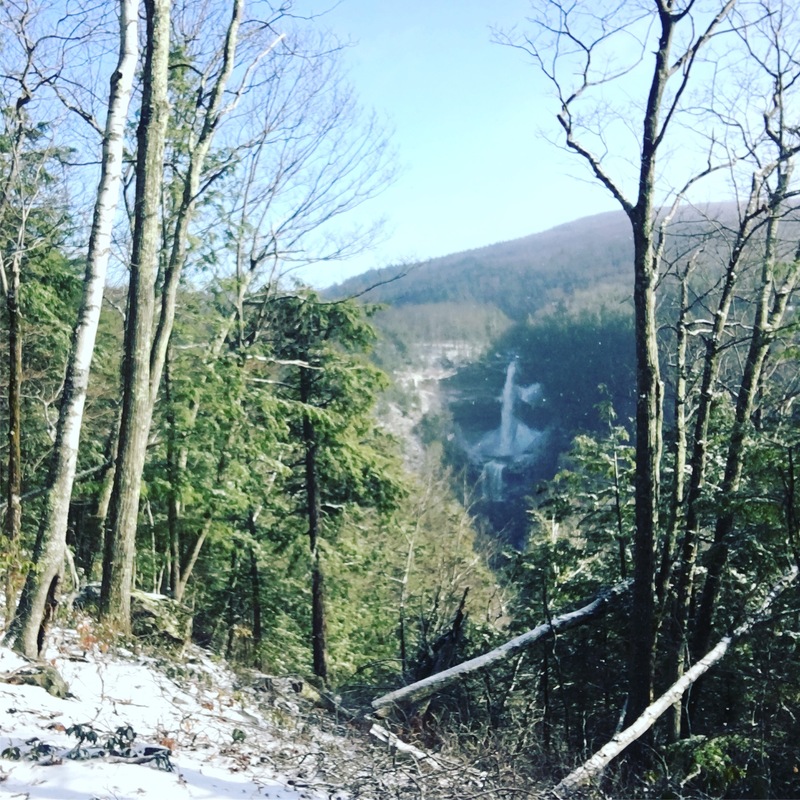 Come see Kaaterskill Falls in all her glory from the winter perspective. See how the waterfall and surrounding land become a winter spectacular. This snowshoe will depart from the MTHS campus and proceed along the KRT 1.5 miles to the Laurel House Road parking area. 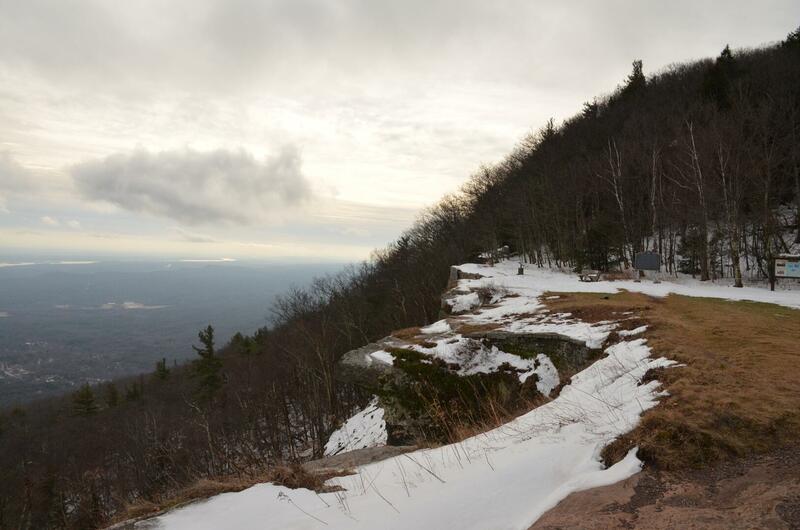 From there, we will follow the path down to the Kaaterskill Falls viewing platform. Once folks are ready to depart we will retrace our footsteps back up the trail to the parking area. Then we will follow the KRT back to the Mountain Top Historical Society. Folks wishing to participate on this walk need to bring their own snowshoes. At this time we do not have the ability to rent snowshoes but if this proves to be a popular walk we can look into snowshoe rental. If folks wish to come on this walk without snowshoes a pair of microspikes would be highly recommended for possibility of ice on trail. Come explore the beauty of the forest during winter time. Come cross-country ski the KRT from The Mountain Top Historical Society. We will meet at the parking area at The Mountain Top Historical Society and cross-country ski the KRT. We will then cross over the new bridge over the creek and continue on the horse trail to the South Lake Road. We will follow South Lake road to the beach parking area and then if folks want to continue on to the Catskill Mountain House Site. From here we will retrace our path, following the South Lake Road to the horse trail back to the KRT and finally ending at The Mountain Top Historical Site. Folks who join can make this as short or as long of a cross-country ski and I am allotting 4 hours. Folks wishing to participate on this cross-country ski need to bring their own skis. At this time MTHS does not have the ability to rent cross-country skis but if this proves to be popular we can look into rentals in the future. All of these outdoor events will take place during the winter season. Winter activity can require different planning than that for spring, summer and fall. All of these activities are on easy to moderate terrain, but in winter conditions ice and snow can be slippery even on flat terrain. Having proper items with you is imperative. Dress in warm layered clothes which can be removed or added back as the body warms and cools. Bring plenty of water and snacks to keep energy levels up. You burn more calories in winter conditions which keeps the body warm. Carrying a backpack to hold items will make carrying what you need much easier. These events can happen during light snow. Any major storm or rain will postpone the event and a new date determined. Moe Lemire is a trained and licensed guide. He is CPR and first aid certified. Exploring the outdoors during the winter can be a rewarding experience. MTHS does not require membership for hike participation. We do however request that you register for each hike. Participants can register on our contacts page or by calling (518) 589-6657. Please leave your name, phone number, and # in your party. Schedule subject to change. The latest information is available on our web site http://www.mths.org. Notification of changes, including cancellations due to weather will be made on the web site up to the day of any given hike.